After graduating from high school in Albuquerque, New Mexico, David Valdez enlisted in the U.S. Air Force, where he was trained as a photographer. He served with the 836th Combat Support Group for four years, and then earned a BA in journalism from the University of Maryland at College Park. While he was a student there, Valdez was employed by the U.S. Department of Agriculture and the U.S. Department of Housing and Urban Development (HUD) as a photographer. He left the federal government to become chief photographer for Nations Business magazine published by the U.S. Chamber of Commerce. In 1983, he became the personal photographer to then-Vice President George Bush. In 1988, President Bush appointed Valdez Director of the White House Photo Office. During this administration, he traveled to 75 countries and all 50 states with the President. In 1997, he published George Herbert Walker Bush: A Photographic Profile. Valdez was appointed general manager of photography for Walt Disney Attractions in 1993. In 2001, he became Special Assistant to the HUD Assistant Secretary for Public Affairs. Valdez became the Vice President for Business Development for Blue Pixel Digital Experts. Blue Pixel was digital photography consulting firm. Blue Pixel contracted with Nikon and Microsoft. From 2003 to 2010, Valdez was the Director of Visual and Electronic Information for HUD’s Assistant Secretary for Public Affairs. Public Speaking engagements such as Harvard, University of Texas Austin, Franklin Pierce University, Presidential Libraries, museums, civic and political groups. Valdez is on the Board of the Briscoe Center for American History at the University of Texas and an advisor to the Marlin Fitzwater School of Communications at Franklin Pierce University. More photos published in countless other publications and books from around the world. David Valdez on FOX News about the passing of President George H.W. Bush. David Valdez on CBS News about the passing of President George H.W. Bush. David Valdez on KVUE ABC about the passing of President George H.W. Bush. David Valdez in The Washington Post about the passing of President George H.W. Bush. David Valdez Oral History Interview on C-SPAN3 David Valdez talked about his photographs of George H.W. Bush which he took as the vice president’s personal photographer and then as White House Photo Office director from 1989 to 1993. He showed behind-the-scenes photos of the Bush administration at the beginning of the Gulf War, during the fall of communism in Eastern Europe, and of private moments with the Bush family. The Briscoe Center for American History at the University of Texas recorded the interview and archived his photos along with those of other nationally recognized photographers. I recently held a photo walk in Georgetown, Texas with the photo group called PhotowalksGTX. 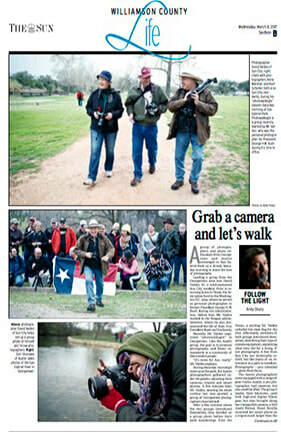 We were joined by PhotowalksATX, a group of photographers from Austin, Texas. The Sun sent out Andy Sharp to do a story on our day. 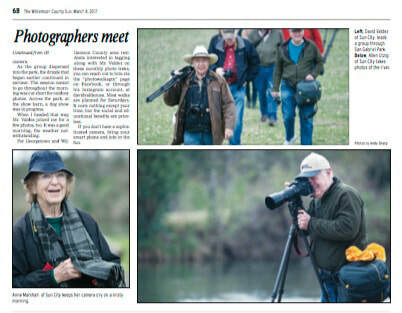 Thanks Andy for the nice article in the Williamson County Sun. Photographing the President: A Look Back at Every White House Photographer A feature story about former Presidential Photographers. City Insider the #1 Independent Magazine for Sun City in Georgetown, Texas just did a featured article on me highlighting my time as the personal photographer for President of the United States George H.W. Bush. David Valdez will be a featured speaker at the Bell County Museum in Belton, Texas October 29, 2016. This presentation is in conjunction with the National Geographic film and book "The President's Photographer". David will be speaking about his White House photography during the administration of President George H.W.Bush. Texas Monthly mentioned David Valdez in short article.